This entry was posted on July 8, 2011 by Sports Traveler. Summer is in full force and so is the NASCAR regular season. After 17 races the Chase picture is beginning to take shape. Kevin Harvick established a lead early on in the season and has held on to the top spot for the most part and will essentially be able to cruise into the Chase. With only 9 races remaining there are several teams that will be using the "make or break" mantra for the remainder of the regular season. Currently the standings show Tony Stewart in the last spot to make the Chase with Greg Biffle and Juan Pablo Montoya being the last two on the outside looking in. So as for usual, the season is heating up right when the temperatures begin to stay hot. Be on the lookout for rising tempers as well. Every year the NASCAR circuit features two races at Bristol Motor Speedway, and this year marks the 50th anniversary of the legendary track. 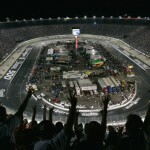 On August 27, 2011 the track will host its annual night race (Irwin Tools 500). The fall race at Bristol is considered by many to be the hardest ticket to come by in NASCAR. 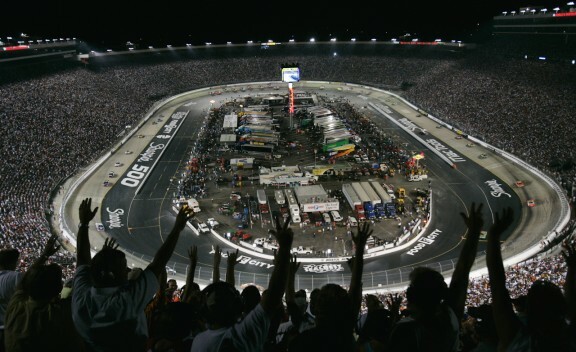 From a fan's perspective it doesn't get any better than a night race at Bristol. 500 miles, 43 drivers (at the drop of the green flag), turns banked at 30 degrees, speeds up to 120 mph on a half mile track, and it all happens under the lights. If this doesn't get your blood pumpin' then check your pulse. If you are looking to feed your taste for excitement then check out Sports Traveler's Bristol tickets and travel packages. At Sports Traveler we offer great and affordable travel packages to Bristol Motor Speedway and every other NASCAR race. Just looking for tickets? No problem. Sports Traveler has a variety of adequately priced tickets for the fall Bristol race and hundreds of other events. Whether its watching your favorite driver win the race or seeing your favorite team win the game, Sports Traveler will always be your best resource for sports travel. Bristol Motor Speedway is in the Guinness Book of World Records for housing the enactment of the largest human wave ever. This feat was accomplished during August of 2008.